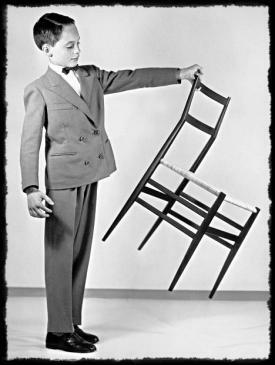 Restoration of a “Superleggera” Chair, Designed by Architect Gio Ponti. Taken from a 1950’s ad, demonstrating that these chairs are, indeed, “superleggera”. Superleggera mean “Super-Lightweight”, in Italian, according to Citizen Cane Chair Restoration of Huntington Beach, California. That was the name given to this chair by its designer, Gio Ponti (1891-1979), a prolific and versatile Italian architect and designer active from the 1920’s to the 1970’s. This chair is built of ash, and is a marvel of strength, elegance and light weight – – under 4 pounds. Built in the early 50’s, these chairs demonstrate that Ponti was indeed an early master of modern, minimalist furniture design. Legend claims that Ponti product tested these chairs by pitching them into the street from a fourth floor window. If these five chairs received that treatment, they survived it well, though their cane seats wore out after some decades of active domestic service. Seeking the most durable solution, Citizen Cane proposed a simulated hand weave in a herringbone pattern glued to a custom fit substrate panel fitted within the rails and stiles of the seat frame. This solution recreated the delicate look of the original hand woven seats in a more durable form. 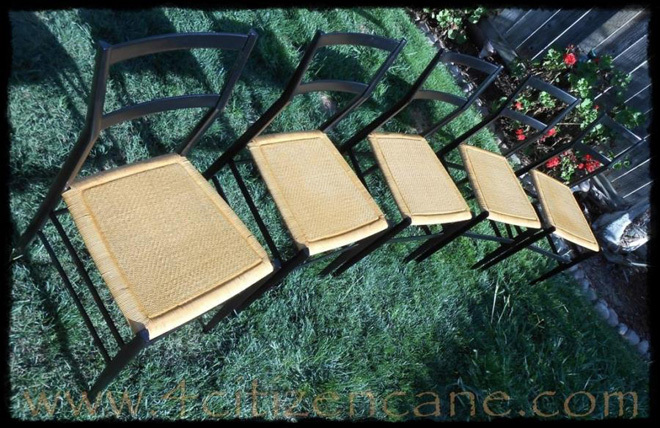 The five chairs look stunning with multiple coats of satin black lacquer. List of Furniture Restoration Specialists. The 5 chairs, stunning with new seats and satin black lacquer. This entry was posted in Furniture and tagged California. Bookmark the permalink.